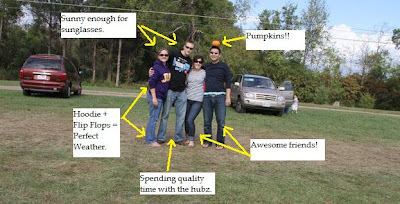 As illustrated in this photo from last October, there are many reasons I love Fall. In addition to spending lots of quality time enjoying beautiful weather with friends, I LOVE pumpkins. It's kind of a problem, actually. Signs of a perfect autumn day. I was SO excited last week when the farmer's market finally had pumpkins available. I purchased one right away, roasted it (along with some other hard-shell squash I had laying around) and tucked it in my refrigerator until I had time to make the pie I had been dreaming of since last fall. So, in spite of a crazy Sunday filled with marching competitions, yoga, laundry, yoga, grocery shopping, taking care of the dogs, and yoga... I decided to make my first pumpkin pie of the year. This is my grandmother's recipe--it's a little different than most, but I LOVE it and hope you will too. I would also like to note that Granny didn't really believe in measuring ingredients (even when baking), so you'll see that my process is a little bit different than the printed recipe. (She also didn't believe in pre-heating the oven, but I wouldn't go that far.) And yes, fresh pumpkin takes more time but it also makes all the difference in the world. Gather your ingredients. FRESH roasted pumpkin, sugar, flour, sweetened condensed milk (fat free here), vanilla bean paste (or vanilla extract), eggs, nutmeg, cinnamon, and ginger. Be sure you have a pie crust (I cheat and use the unroll-and-bake kind), a pie pan, and a clean tea towel handy as well. Fresh pumpkin has a lot of water in it, so start by piling the pumpkin into your tea towel. Next, you dump your pumpkin, sugar, spices (cinnamon, nutmeg, and ginger--heavy on the nutmeg; it was Granny's favorite spice! ), and flour into the mixing bowl and mix well; scrape down the sides as necessary. Next, add each of the two eggs, one at a time, beating after each addition. You can choose whether or not to add the water. If you're using fresh pumpkin, I don't think it needs it--but if you're using (blech! sacrilege!) canned pumpkin, you may want some to thin the filling out. Prepare your pie crust and have either pie shields or a couple of strips of aluminum foil (not shown) handy. Fill your pie--be sure it isn't TOO full though! Put the pie on a baking sheet and wrap the foil around the crust to protect it from burning. When the pie emerges, it will look something like this--golden brown and fluffy. Give the pie a little wiggle before you take it out of the oven so you can be sure that the center is set. As the pie cools, the puffiness in the middle of the pie goes away. All you're left with is this pure deliciousness. I find it so delicious that I kind of stared at my pie as I savored the first succulent bite... and even though I hadn't said a word, Duff Man accused me of bragging about my amazing pie! I guess my face said everything I needed it to. Combine pumpkin, sugar, salt, spices, and flour in a mixing bowl. Add evaporated milk, water and vanilla, and mix well. Pour into crust-lined pie pan. Cover the edges of the pie shell with foil to avoid overly browning them. Reduce heat to 350°F and bake for 35 min longer or until set.